Discussion in 'Casual Photo Conversations' started by bc_photo, Mar 28, 2008. I have a show coming up on Sunday in which my images will be displayed on a 42"
Depends on the device that will be sending the images to the TV (is it the TV itself)? Not necessarily; you should test this. Even though the TV may use sRGB, it's entirely possible to override that with gamma, brightness, contrast, color, and tint controls (to name just a few). 1) Think pixels - dpi means nothing. Unlike printing, you can't put more dots into a display pixel. 2) On image size, it depends how much border or black space you want. Maybe you want some text? 3) JPEG Level 10 is more than sufficient and results in small files. 4) sRGB files will be fine. The device that will be sending the images to the TV will be an apple computer, using iPhoto. So, if I prep these RAW files in Photoshop, what would you guys suggest for the file settings for a 1080p HDTV? I need to set a resolution and file size in the image properties dialogue. Also, would you suggest using one of the Film & Video file size presets available in CS3. And if so, which one? I think Brad just told you. Thanks, do you suggest using the CS3 preset? Image resolution is dependent on the size of your TV. If you have a 40" 1080P LCD with a size of 39"x25", the dpi is around 40-49 dpi (1080 vertical pixel divided by 25"). The importance of dpi is it affects your sharpening parameters. For a 50 dpi output, the unsharp mask radius should only be about .3 pixel to avoid over sharpening. I hate oversharpened images with an unwanted halo effect. Experiment with different amount as your taste may be different. MB is correct, HDTV native resolution is 1920x1080, so that should be the size of your image. Note that your TV chassis may crop some of that image, so your image may be 5% smaller, plus a gray border to fill up to 1920x1080 so nothing blocks the image. If you use iPhoto's Ken Burn effect, your image should be slightly larger so there is room to pan across the image. Make sure you try out the Ken Burn effect before hand using one or two slides so you like what you get. I tried using Ken Burn effect on 1080i HDTV and the effect was horrible. File type does not matter, just stick with jpg and use a high quality setting. HDTV resolution is inferior to a high quality PC monitor. 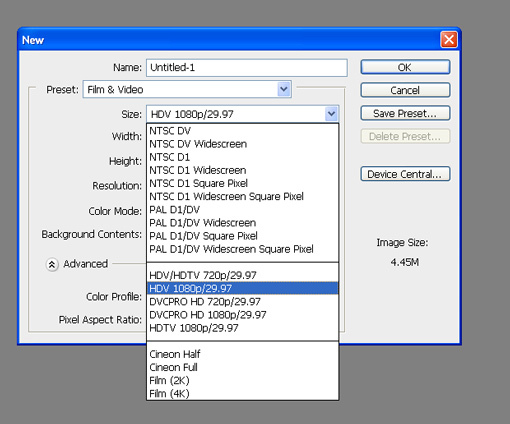 I use AdobeRGB on my Panasonic 42" plasma and my 34" Sony XBR CRT, both are 1080i HDTV. Use the cropping tool to crop your image. Set the parameters to 38.4 width (1920/50dpi), 21.6 high (1080/50dpi), and resolution of 50dpi. The finish crop will be at 1920x1080. No need to use the new file preset menu. Well, then JPEG with maximum quality will suffice. For color issues, I would suggest you consider calibrating for the TV using ColorSync (advanced part of Displays control panel). Aren't you all mixing up dpi with ppi? I know this is an old thread, but hoping I can get a reply. What software did you use to design your Slideshow and how do you export/render?